The nodal network systems operator-maintainer is part of the Army's telecommunications team. Their primary responsibility is making sure communications are available, which is always crucial in the armed forces, especially during combat. These soldiers perform field level maintenance on electronic nodal assemblages, combat net radios, and ancillary communications equipment. In other words, they keep the telecom equipment up and running. A key part of the job for MOS 25N is performing system and network operations, which includes correcting any faults in the system. They're responsible for upkeep and maintenance of internal communication systems and devices. Job training to be a nodal networking systems operator-maintainer in the Army requires nine weeks of Basic Training, followed by 21 weeks of Advanced Individual Training, including hands-on training with mobile and nodal networking systems. This training will take place at Fort Gordon in Georgia. 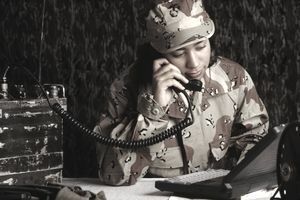 As your military career continues, you'll have the opportunity to take more classes and receive training that will allow you to progress into more advanced positions in the Army's telecom field. An interest in working with nodal equipment, knowing how to configure and troubleshoot equipment like routers and a thorough knowledge of internet protocols are all good skills to have if you're considering this job. To be eligible for MOS 25N, a soldier needs a score of 102 in the electronics (EL) aptitude area and a score of 102 in surveillance and communications (SC) on the Armed Services Vocational Aptitude Battery (ASVAB) test. Since soldiers in this job have access to and work with sensitive military information, candidates need to qualify for a secret security clearance. Past criminal activity, particularly drug-related offenses, and financial problems may disqualify soldiers from this type of clearance. In addition, you should be able to clearly enunciate spoken English, be a U.S. citizen, and be able to work easily for extended periods of time in confined areas. You can receive credit for successful completion of one year each of high school algebra and science. If you're successful in this role, you may eventually be able to take an exam to move up to the position of MOS 25W, telecommunications operations chief. In that role, you'll oversee all information systems support functions for command, control, communications, and computers. The skills you learn will in this Army job help prepare you for potential careers in network support, data processing, and computer programming.